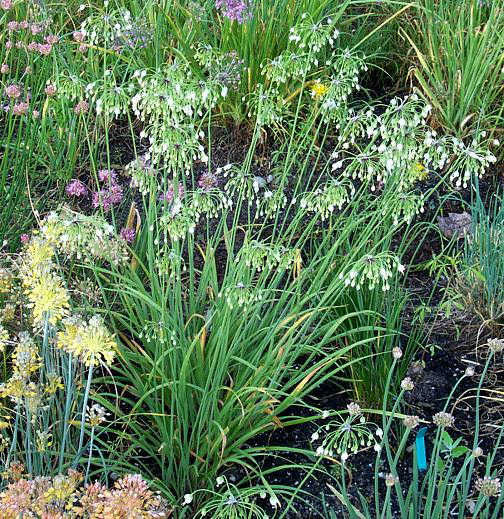 Allium cernuum - mass planting. 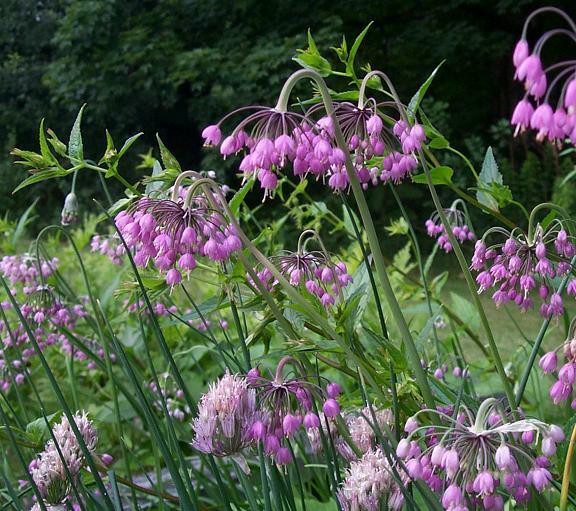 In the first view, we see prolific blooms on a tall rose purple form of the "nodding onion" flowering in late June. 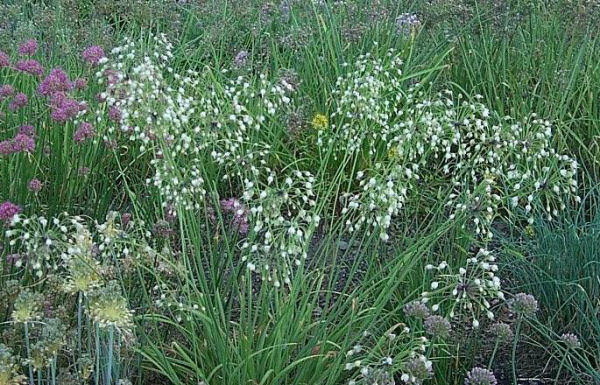 The nodding onion hails from most states within the USA (and up to Canada) and therefore is extremely variable. 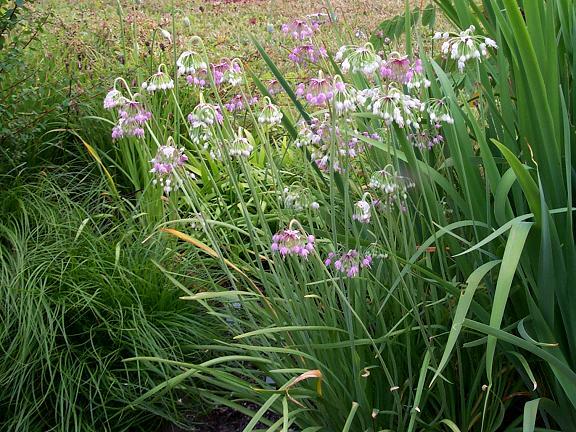 In the lower left corner of the photo is Lilium formosanum var. pricei. In the second we see 4 nodding buds. 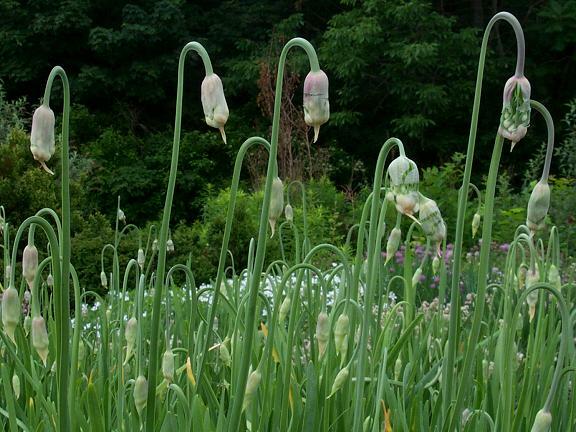 It is clear why the "nodding onion" received such a common name, when one views the drooping buds. In this view the buds are just breaking through the bud spathe. 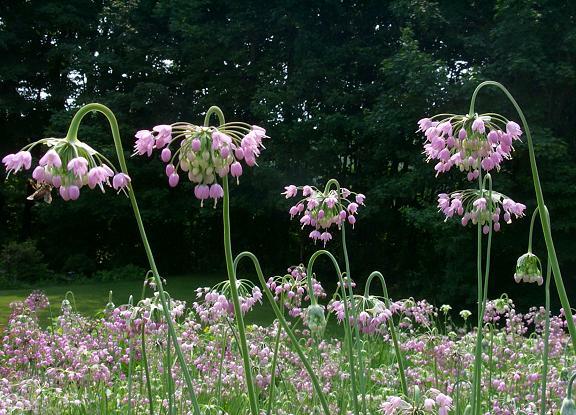 The third is a similar view to the preceding, but here the flowers are open, showing nice pink rotund florets, hanging downwards. 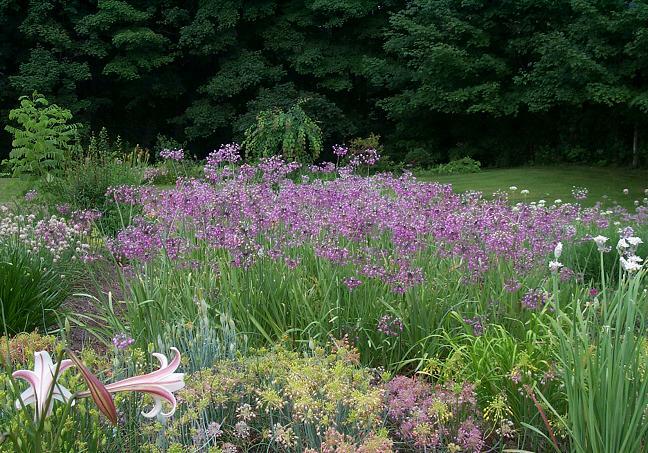 The final shot is a "good pink form" - the tall stems growing up through the invasive Campanula takesimana. Photos by Mark McDonough. 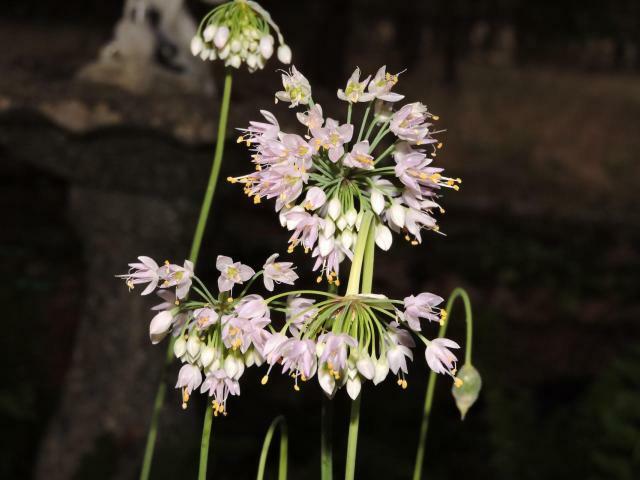 Allium cernuum 'Leo' - one of my favorite cultivars, with tall, stiff stems to 30" (75 cm) or more, topped with clusters of white flowers (sometimes showing a tinge of pink in cool weather) that are denser than normal. 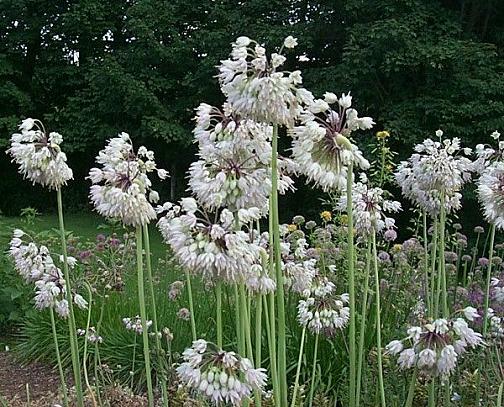 Also distinctive in it's late flowering, in full bloom in mid August. The foliage is also shorter and neater than most cernuum forms... could have some A. stellatum blood in it. In the last two close-up views of the flowers the very short and tight "crook-necked" buds, the later than normal flowering period, along with the sideways disposition of the inflorescence, indicates some A. stellatum influence. Photos by Mark McDonough. 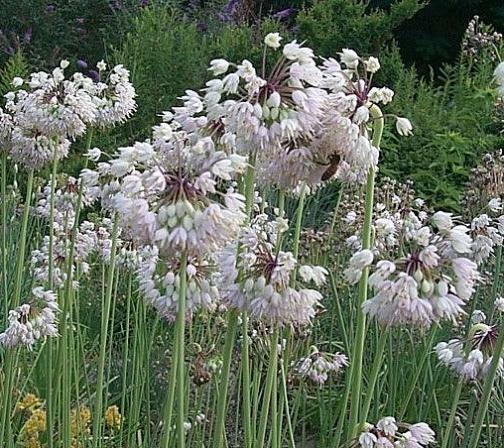 Allium cernuum 'Oxy White' (syn. A. oxyphilum) - I've tried photographing this delicate beauty for years but never really captured the essence of this fine plant. 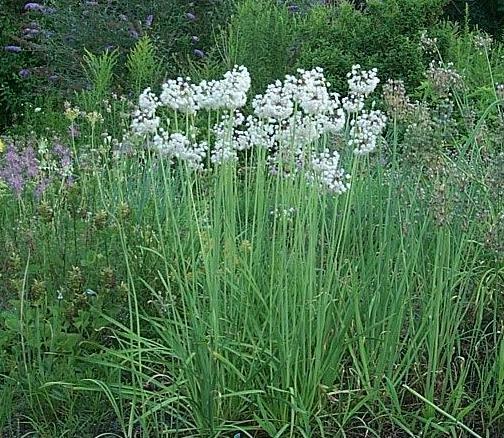 From southeastern USA, once regarded as a separate species (A. oxyphilum), most authorities now regard this as merely a form of A. cernuum , as do I. 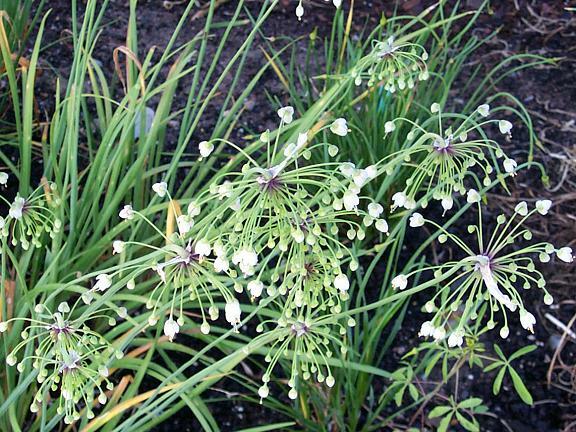 It's a most airy and delicate plant, with slender stems, and thread-thin pedicels holding little white flower droplets. In the last photo, seedlings of A. cernuum 'Oxy White' show lots of variation and a tendency back towards normal cernuum appearance. Photos by Mark McDonough. 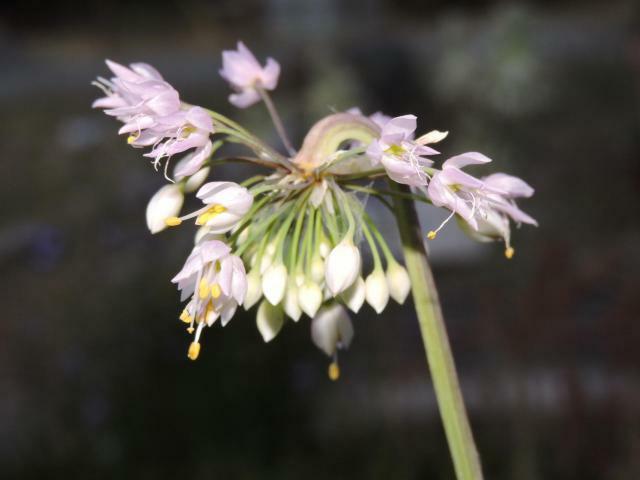 Photo of seed grown Allium cernuum, flowering for the first time in July of 2015, photographed by Travis Owen.